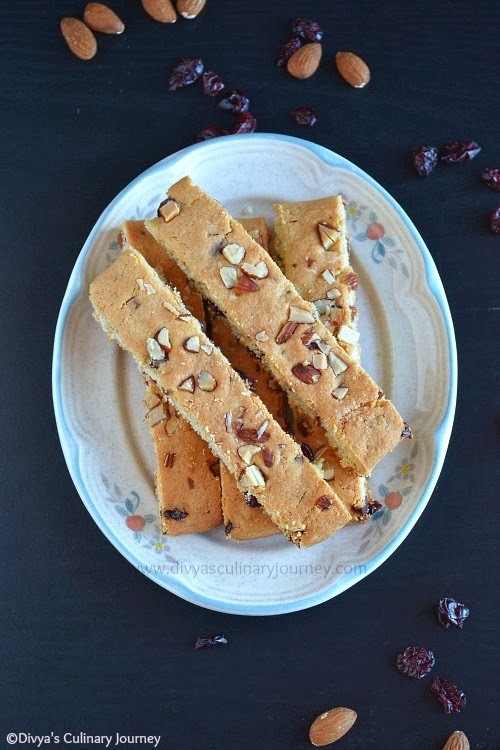 Today's recipe is Almond Cranberry Biscotti. 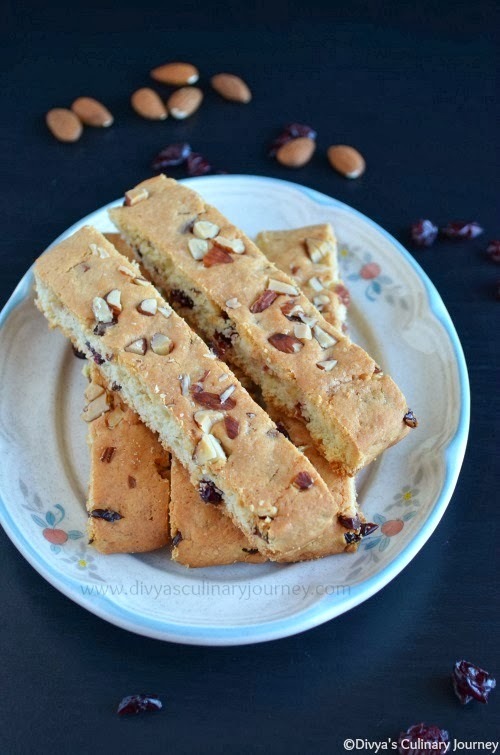 I was never a fan of Biscotti until I tried this recipe. Unlike the traditional Italian Biscottis which are hard, this American style Biscotti is light and crunchy. 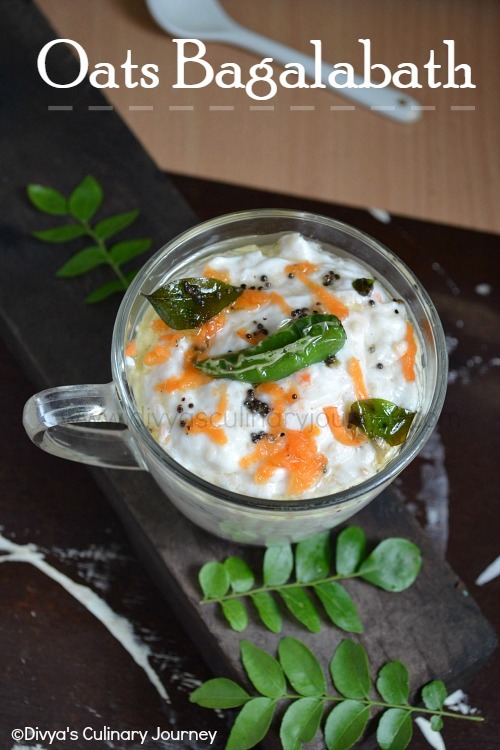 I baked this for the Home Bakers Challenge by Priya Akka. 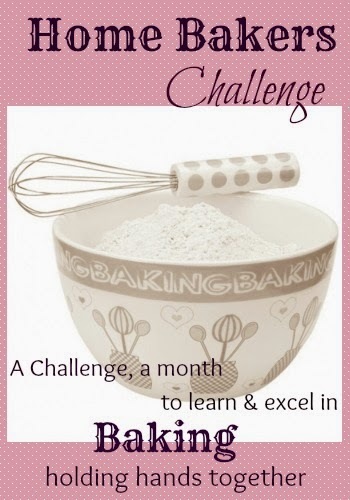 This month's Challenge is Biscotti. No one at our home likes Biscotti, but I didn't want to miss the challenge too. I went ahead and baked the American style vanilla Biscotti but I had halved the recipe she had given. I also added almonds and dried cranberries to it. The biscottis came out so delicious, they were finished so soon. Am so glad that I didn't miss this challenge. I will be definitely baking this again. Pre heat the oven to 350 F and then line a baking sheet with parchment paper and keep it ready. In a bowl, cream together butter and sugar. Then beat in egg and then add vanilla extract, almond extract and mix well. Then to it add salt, baking powder and keep mixing then add flour little by little till all the flour is added. Then add the chopped almonds(reserve some to add it later) and cranberries and mix well. The dough will be sticky. Apply oil to the hands for handling the dough easily. Transfer this dough to the prepared baking sheet and shape it into a rectangle log of about 3/4" thickness. Then add the reserved chopped almonds on top of the prepared log and gently press it. Now bake this for about 25 minutes. Then remove from the oven. Reduce the oven temperature to 325 F.
Then spritz water lightly to cover all sides of the log. let it cool for 10 minutes. Then using serrated knife, slice them crosswise of about 3/4" slices. Now arrange the sliced biscottis in the baking tray such that almond studded surface is on the top and bake it for another 20 minutes or till they start to turn golden. Remove from the baking sheet and let it cool and transfer it to airtight container. The number of biscottis depends on the size of the log you make. For me it yielded about 10 biscottis. This is mildly sweet, you can adjust the sweetness as per your preference. 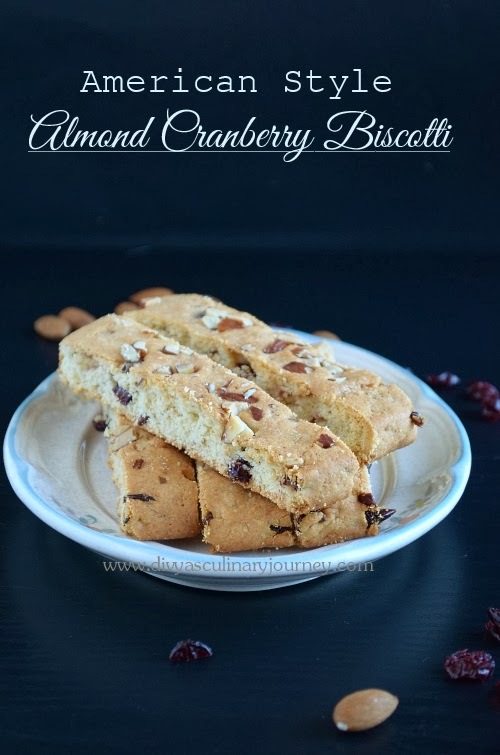 You can omit cranberries and almonds for plain vanilla biscotti. Or you can add nuts and dried fruits of your choice too. This is for the Home Bakers challenge. To know more about the challenge click here. Loved your biscottis.They look crunchy and perfect.WE love cranberries too .So i will try it next time.